I want to share a YouTube channel that has recently been my procrastination/lunchtime media of choice. It’s called “The Great War” and is a weekly series recounting the events of World War I as they occurred 100 years ago. In case you forgot, the Archduke Franz Ferdinand was assassinated on June 28, 1914 and the war began soon thereafter. Throughout this year, there have been a number of centennial events related to the war and more are sure to come as the US entry in the war did not take place until 1917. This channel is one of my favorites so far because it tries to present the events of the war as complicated and outcomes as uncertain. It also makes good use of historical photographs, newspapers, and films to illustrate the events of each week. These images really help people connect to the history and I only wish they were cited so I would know where to find them myself! As the series continues, I would hope to see more regarding the utter futility of this war, its devastating effects on the people of Europe and European colonies who were conscripted and brought across the world to fight, and the ways in which it laid much of the global framework still in place today. While 100 years seems like a long time ago, in fact this war is still very present in the historical memory of many communities. This channel is far more nuanced than the average treatment of WWI but still relies essentially on telling the military and political history of the conflict, while doing less to problematize, pick apart and challenge some of the issues. I also love the production and set from which the host delivers the week’s update. Is anyone else out there watching or reading anything about World War I? Is there something great I haven’t found? Let me know, for it appears I’ve unleashed the History student within. As an undergraduate history major, I am often stuck when considering that the First World War began in 1914, one hundred years ago this year. It is astounding to think that in the past century we’ve gone from mounted cavalry charges and trenches to drones and nuclear aircraft carriers– but that’s a topic for another post. 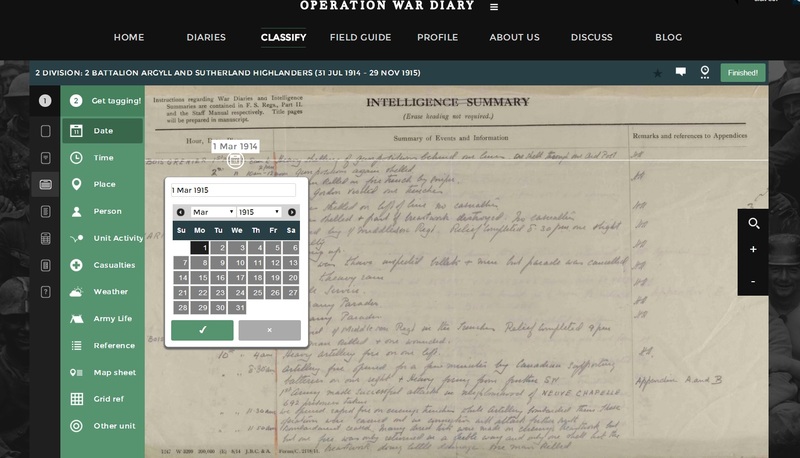 This week, to mark the centennial of the beginning of this conflict, the British National Archives have digitized and made available an excellent collection of war diaries (check here for the collection itself). These diaries are official accounts, written by soldiers, of the events taking place in every British military unit. This week, the project was the subject of a New York Times article that caught my eye and inspired me to investigate the collection. 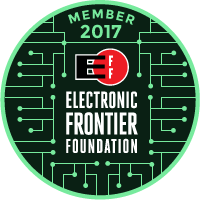 I also recently received an email from the folks at zooniverse.org, a citizen science portal that I’ve used in the past to participate in a few fascinating crowdsourced tagging projects, announcing the start of a tagging project for the War Diaries. I had to see for myself what kinds of information could be found in these documents. As you can see, this is a very robust interface that allows users to add a range of tags and other notes to the pages of war diaries. Beginning with dates and times on the left side of the page, moving to descriptions of troop movements, casualties, officers and awards, and concluding on the right-hand column with notes directing readers to associated documents, there is a lot of work to be done on each page to extract valuable data! I was only able to do a few pages before my eyes got tired trying to decipher the handwritten notes, but I’ll be back. Are you interested in World War I? Citizen science projects? Collaborative tagging? Novel and robust interfaces for academic digital projects? Then I encourage you to check out Operation War Diaries and contribute to a valuable project! Note: Wikipedia links added for reference. World War I is a fascinating, tragic conflict.